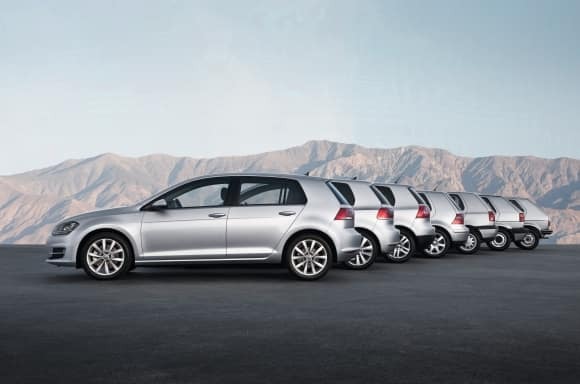 Volkswagen is celebrating 45 years of the fun-to-drive VW Golf! The Golf is the best-selling VW with 35 million units sold worldwide, with its first U.S. sale in December 1974. The Volkswagen Golf has seen seven generations throughout that period of time; each building on the great success of the previous generation. The VW Golf has been on the Car and Driver’s 10Best list for 13 straight years! The first generation of Golf included model years 1975 – 1984. It was originally sold as ‘Rabbit’ and featured a 1.5-liter engine with 70 hp. The second generation went through model year 1992 and was known as ‘Golf’. The standard engine was then a 1.8-liter with 85 hp. This version saw the introduction of anti-lock braking and power steering. The third generation shifted to a wedge shape. It featured a 2.0-liter with 115 hp, front and side airbags, and the first availability of cruise control. The fourth generation Golf was available as model years 1999 through 2005 and debuted features such as electronic stability control, 4Motion® all-wheel drive, and navigation. The fifth generation was once again known as ‘Rabbit’. Rain-sensing wipers and Bi-Xenon® headlights were introduced in this model. Generation VI (model years 2010 – 2014) marked the return of the name ‘Golf’. The currently available model, the seventh Volkswagen Golf generation, is available in two trim levels — S and SE. Both have the 1.4T engine with 147 hp, which can be paired with a manual or automatic transmission. Every Golf in both trim levels has Volkswagen Car-Net® App-Connect, Blind Spot Monitor, Rear Traffic Alert, Forward Collision Warning and Autonomous Emergency Braking with Pedestrian Monitoring. 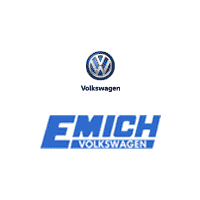 Visit Emich Volkswagen in Denver to see the 2019 Volkswagen Golf. Let us show you the many super features that make the Golf such a popular VW model!